It’s nothing personal, strictly business. Signings of younger, cheaper talents this week by the Seattle Sounders make doubtful the return of veterans Andreas Ivanschitz and Nelson Valdez. 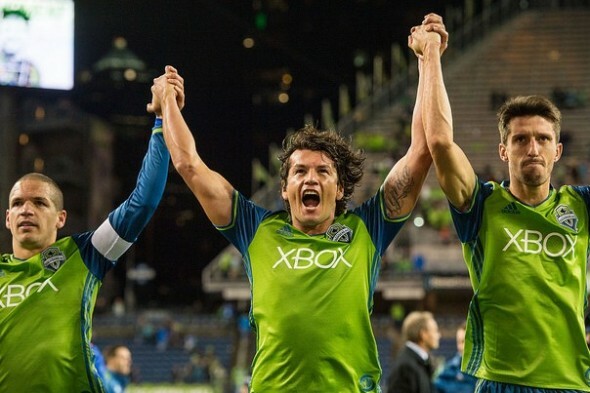 Suddenly, center back Roman Torres may be the only one from the Seattle Sounders’ slew of summer signings during the dark summer of 2015 (a 1-9 stretch that derailed a campaign to repeat as Supporters’ Shield champions) to survive Seattle’s first MLS Cup victory. With the acquisition of midfielder Harry Shipp from Montreal Thursday and forward Will Bruin from Houston Friday, it appears the tenures of Andreas Ivanschitz and Nelson Valdez are drawing to a close in the Emerald City. As is always the case with roster movement off championship teams, the issue is financial. Ivanschitz and Valdez were brought in on free transfers (meaning no payment was made to their previous club, often allowing for more money to be given to a player for a new contract) from Levante and Frankfurt, respectively. They were part of a coordinated effort to right a 2015 season that suddenly was going very wrong. The summer signings (and the return to health of Nigerian forward Obafemi Martins) did enough to push Seattle into the playoffs in 2015. But the exhausted club eventually succumbed to FC Dallas on penalty kicks. Valdez scored crucial goals in the playoffs this year, but was likely cut for being too expensive. Valdez is an understandable excision. Paid nearly $1.5 million a year, the Paraguayan forward scored one regular-season goal in 31 appearances. Two crucial playoff goals in an MLS Cup-winning season was not enough to indulge his occupation of the coveted designated player roster spot. Sounders GM Garth Lagerwey spoke to media via conference call Friday, explaining that many of Seattle’s roster cuts, which took place one day after the club had claimed the league title, were necessary due to built-in contract bonuses for winning the MLS Cup. “When you don’t pick up players’ options, particularly after you won a championship, there’s not always a warm and fuzzy on the other side, quite understandably so,” Lagerwey said. “Those guys will do what’s best for them, for their careers. At a little more than $300,000 per year, Bruin will be more affordable as the Sounders look to build a roster that can score, should Jordan Morris be out. Bruin is a proven entity, with 50 league goals in his six years for the Dynamo. Paid $270,000 a year, Ivanschitz likely became redundant. The technical midfielder was not known for his defensive skill, mostly brought in as a set-piece specialist noted for his left foot. The arrival of Nicolas Lodeiro made Ivanschitz’s three goals and eight assists in 2016 look less valuable. Shipp, at $129,500 per year, can easily earn his keep if he can fill most of Ivanschitz’s duties. The fate of Erik Friberg, the last international acquired during Seattle’s summer of woe, is uncertain. Friberg was something of a workhorse for the club, but injuries often hampered the 30-year-old Swede, limiting him to 25 regular-season appearances. At $262,000 a year, the club might keep him if he were willing to accept a pay cut. Given that the midfielder has stated he would like to retire in Seattle, it seems likely that he would be amenable. Torres was the only player who didn’t have to worry about justifying his price tag. Absent most of the season after surgery to fix an ACL tear, he returned triumphantly, shutting down Toronto FC muscle-man Jozy Altidore, and scoring the final penalty kick to earn his team’s first league title. The other three perhaps were victims of panic spending in 2015. With expectations and promises too large to fulfill, it seemed doubtful at the time of their signings that any would become long-lasting contributors. The likely departures of Valdez and Ivanschitz (and less likely departure of Friberg) are just another part of the hard business of pro sports. In a contest between production and loyalty, production wins every time.